If I were to describe my experience here in Thailand with one word, I would have to say unexpected, for it has undoubtedly been a bit of a bumpy ride. From floating markets to dangerous accidents, I can’t even fathom how much has already happened in just one week. There’s no way I will be able to share everything in this short blog, so I will just try to highlight the key events. I hope you find something interesting from all of this rambling! In order to begin, I’ll have to back track and describe my first day here, which started at 7:00am on Monday, May 15th. I arrived far before the rest of the group who landed around midnight, meaning I had the entire day to explore by myself. 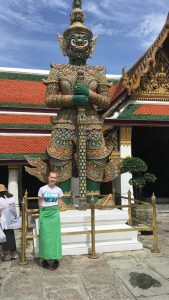 Though I was excited to be independent, it was a bit rough as my luggage got stuck in Abu Dhabi, leaving me to explore Thailand wearing a three day old “Hollywood” T-shirt and no map. Fortunately, right as I found myself lost at a train station, I came across another solo traveler who invited me to go to the Grand Palace with him. The beauty was unlike anything I had ever seen before with statues of demon guards at the gate of the fortress and blue gems embroidered in the Buddhist temple. This is an example of the human built layer of the ecology model and after analysis, we can see how these buildings and interactions within reveal Thai culture as well. For instance, at the entrance, I was surprised by the modest rules that required me to purchase a sarong to cover my leggings. I could not believe that the socio-cultural ideology of respect was so strong that people would rather faint of heat than show their shoulders or legs. Another observation from my first day is that although most of the Thai people spoke English, it seemed as though it was disrespectful if I did not address them with, “sawadee ka.” Therefore, I made a special effort to become comfortable with this greeting as well as thank you or “kap kum ka.” I then visited the Floating Market in Bangkok, which is probably still my favorite experience to this day. 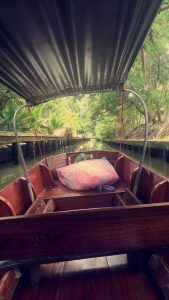 I instantly fell in love with the tropical scenery along the river as well as the handicrafts sold by local vendors, which falls partially into the natural environment layer of the human ecology model. Furthermore, each of these layers impacts Thai families through interpersonal relationships as well as their hospitality for tourists. Surprise, my friend and I got in a car crash. Something you would never expect, right? I know this might not be the normal or appropriate topic for this blog assignment, but after contemplation, I decided I wouldn’t be able to write a blog about Thailand without including this one little enormous factor. The car accident happened Saturday night, May 20th, at around 12:30am on our way home from a bar. 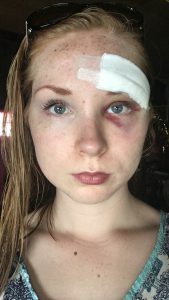 We were stopped at a stop sign in a “red car” taxi (A hooded truck with side benches, no seat belts, and no back door), when I watched a white truck slam into us from behind. The head of another man in the taxi hit my forehead as I was flung backwards towards the front of the taxi. After the initial daze, I noticed that I was covered in blood from head to toe, the white truck was totaled, and the driver had disappeared. My friend got bruises and scratches but no severe injury. About an hour later, I received 16 stitches above my right eyebrow at the local Thai hospital and have had to wear gauze on my forehead ever since. I tried really hard to think of some message or lesson to take away from this and I just can’t. There was no way we could have predicted this nor any way to prevent it. It just happened. It made me think of how fast life could be taken, and how life goes on for others when it is. I’m still not sure if this means I should take risks because yolo or that I should be careful because everything is dangerous. I want to live by the former, but I’m scared now; still haunted by flashbacks of the crash. The monk spoke about relaxing your mind and enjoying the simple things in life and the only thing I knew is that I didn’t want this misfortune to ruin the rest of my trip. I began taking things slow, not just because of my constant headache, but also because of my desire to find peace. The laid back lifestyle of Buddhism conflicts with my Western fast paced culture and I consciously have to keep reminding myself to breath and that this isn’t the end of the world; it could have been worse. Not that I have converted to Buddhism or anything, as I am still Christian, but I have a much deeper appreciation for the socio-cultural ideology that Thai people live by. Furthermore, my experience in Thailand has taken a different turn than others but has still been educational, analytical, and incredibly fun nonetheless. Ultimately, I hope everyone will someday have the chance to eliminate any subconscious biases they have by exposing themselves to the Thai culture, or really, any culture different from their own.